I sincerely like your sense of humor and good nature on all of this...you're exactly right!! It's been going on since time began!! Even in the animal kingdom, there are all sorts of ritualistic attention-grabbing behaviors for those the right age to start mating, seeing who they can interest! The older ones (the "been there/done that" set) just sort of sit and watch, probably amused. Its all for fun. At the end of the day that is why we are all here because we have a passion for our cars whether the same or different, we all end up at the same place to share and give advice! I was always into the stance scene, but too much stretching of the tires, poke, and camber never did it for me. Yes how did i forget those too! Just thought I'd share.. "Hellaflush vs. a functional car"
That video is just too funny! I love the hellaflush sence. Makes the car look so clean and fresh. I am saving up for a good stance but I gotta be conservative since the w204 is my daily. I'd fix the mirror and grille badge, but I would absolutely prefer to own and drive the first one, if those are my only choices. The second one does not appeal to me at all...and clearly has lost a significant amount of suspension capability. Changes that extreme tell me the owner is more interested in showing off rather than a great driving experience...I want the driving benefits of excellent engineering for my own enjoyment and the chassis set up in the first car will be much more capable......and then I would take a photo of it with a telephoto lens at sunset...lol...nice try! The car is on air ride so you could have a "better" driving experience. I know air ride does not compare to a coil over suspension but it fits the gap between road scrapping low on coils and stock "body rolling". My jetta on Konis with hotchkis sways would do circles around my Benz. I guess we can just agree to disagree. Yes, that's not only OK, it's part of the interest for us all talking! We do agree on eliminating body roll, and the Eibach front and rear bars in the C300 do an outstanding job! Haha - correct set-up for posing yeah. Just don't go over 70 and hit a bump! Forget about 100+ safely. i'm thinkin of getting air suspension... but i'm not familiar wth it.. wut r the advantages and disadvantages of the air ride..?? do u think i need to do the body works too..?? i've searched arnd the web for the air suspension for our w204s but couldn't find any.. if u guys know abt it pls gimme a link.. thanks.. Here is a kit for sale. Air ride advantages are comfort and ability to adjust for height. Disadvantages are weight of the system and you sacrifice handling. i must b so dumb.. wut's a static.?? is that hydraulics..?? 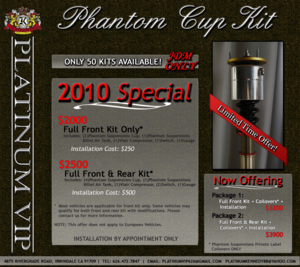 Platinum VIP offers something similar called phantom cup kits. They're located in SoCal, but you would have to call them if they offer them for our w204. 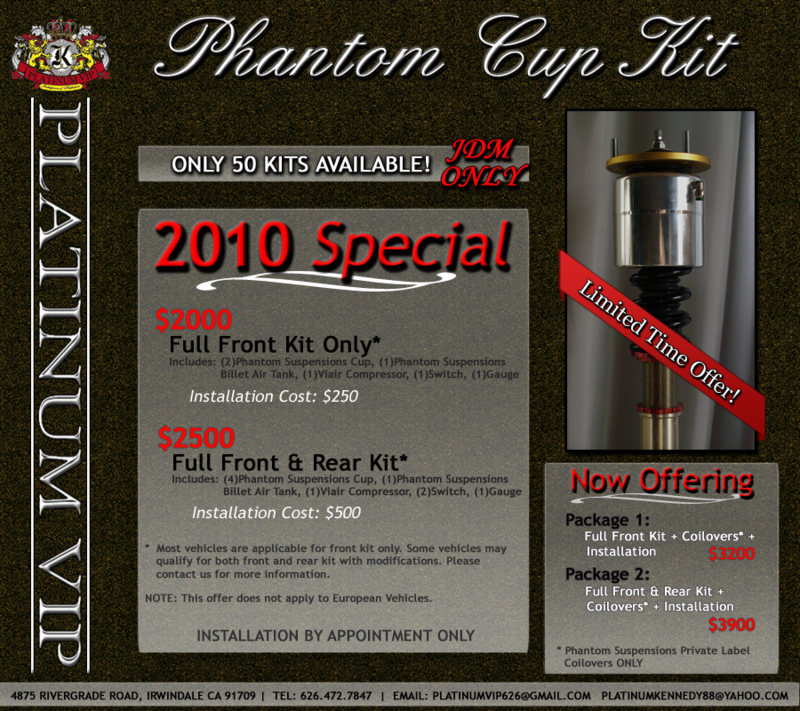 Here's the link to StanceWorks forums where I got the flyer from. In the flyer it says not offered for european vehicles and "JDM ONLY" but it is explained in the forum that they meant the price. You need to contact them directly for information about your benz. Last edited by itsLoonie; 01-20-2011 at 05:32 PM.